My eStore makes online selling as easy as possible. You don’t need to: code, hire a developer, pay lots of money, waste time trying to build one into your site and etc. Our app lets you spend your quality time (because time is money) selling your actual product or service. 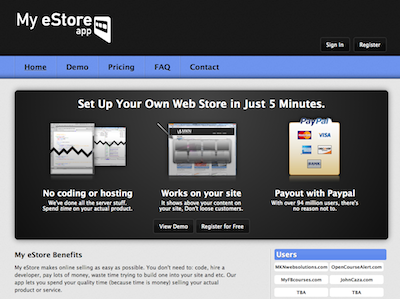 Set up your own web store and add it to your site in Just 5 Minutes.